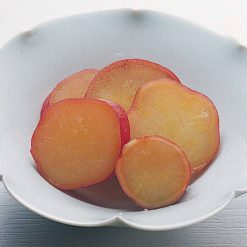 These Satsuma sweet potatoes have been cut into bite-sized pieces (each about 5mm thick) and stewed with just the right amount of sugar. Simply make a cut in the end of the bag, microwave, and enjoy. Product totals 90g (7 to 8 pieces). This item is made using Satsuma sweet potato (either the Beni Azuma variety or the Kokei variety) that has been stewed using only syrup (sugar); creating an umani-style dish and leaving the natural colors and flavors of the potato intact (“umani” is a term which refers to foods cooked in certain types of sweet sauces). 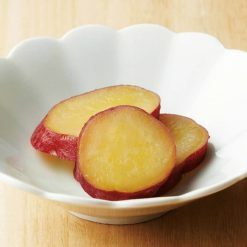 Satsuma sweet potatoes are not only sugary, but also contain vitamins B1 and C. Sweet potatoes digest well, and because they have a lot of fiber they can help to prevent constipation. They may also help to lower blood pressure. Many other similar commercially available items use chemical seasonings. Without defrosting the sweet potato, use scissors to make a cut in the end of the bag for air to escape; then place in the microwave.Approximate cooking times: 2 minutes in a 500W microwave, or 1 minute 30 seconds in a 600W microwave.Sweet potatoes can take a long time to bake or stew from scratch, but because these this item comes seasoned and needs only to be microwaved, it can quickly and easily be served as a midday snack, side dish, or appetizer, even on very busy days. It also makes a great healthy dessert!Note: Some of the wider parts of the sweet potatoes in this item are cut into half-moon pieces rather than circular slices. This product contains satsuma sweet potato (domestic), sugar.. Origin of ingredients: Satsuma sweet potato (domestic). Prepared and packaged in Japan.